New build specialist DGlass completed an Ideal 70 installation on the site of a former Taunton hospital in summer of 2018. 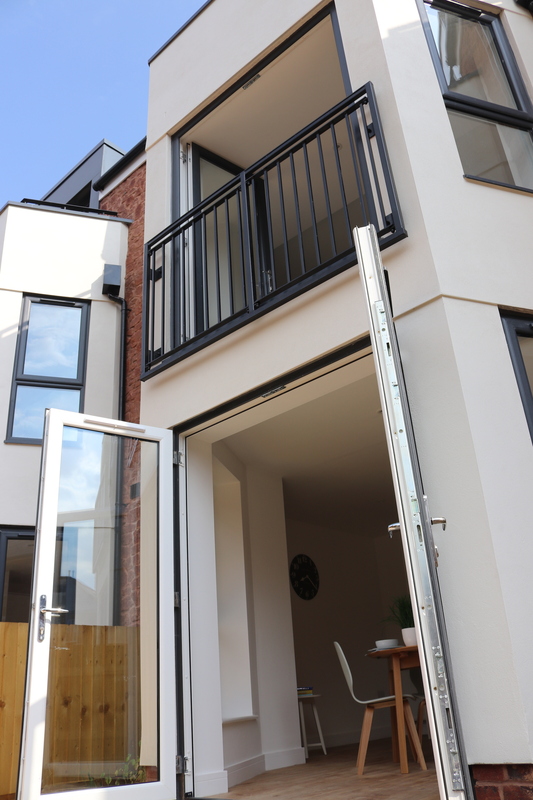 Supplied in anthracite grey on white, the windows and doors have been pivotal in defining the character of the build. Designed in 1892 by architects Gile, Gough and Trollope, Tone Vale Hospital (at the time Somerset and Bath Asylum), opened in 1897. Almost a hundred years later, it closed its doors to patients for the last time in 1995, part of a series of hospital closures as government policy shift towards the Care in the Community programme. Built in the red/brown local stone, the site included the imposing main Grade II listed hospital building, church and a collection of Victoriana mews and outbuildings. 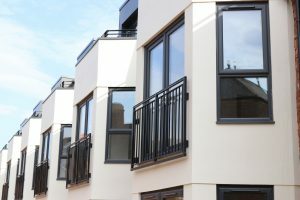 These provide the site for Cherry Tree Mews, a development by the Jones Building Group, which has intelligently converted existing buildings, combining them with new additions to the site. This includes a gate house, six town houses and a lodge house, split into two separate properties but designed to appear as if a single building, and a number of luxury apartments, converted from within the main building. What defines these buildings is the design of the windows and doors. These were originally specified in aluminium but redesigned in PVC-U by DGlass. “The original design of the windows was in aluminium”, says James Clayson, General Manager D Glass. “The windows had really large openers on it, with full height push-out the windows. That’s something that you can’t achieve with PVC. “At the same time you have to ask ‘does that give the property any character?’ and the answer was ‘no’. All it gave you was a single run of glass. “We have redesigned it in aluplast’s Ideal 70PVC-U suite to break up that run. One it’s better structurally and delivers better thermal performance and second, visually, it’s absolutely fantastic”, he continues. 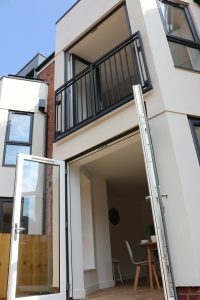 The windows were supplied in anthracite grey on white in the German-engineered Ideal 70 PVC-U window and door system from aluplast. The five chamber thermally efficient system encompassing the ecologically sound ecotech process is at the cutting edge of PVC-U window and door technology. With a choice of 24mm to optimum 40mm triple glazed options, the slim line system easily achieves a WER A+ rating with standard components and A++with specific profiles and IGUs. Including 120 casement windows, French doors, Juliet balconies and side-lights windows were designed to complement the red/brown of the stone used in original buildings. At the same time they were also chosen to contrast with the contemporary white render used at the front and rear of the buildings, the anthracite grey exterior of the windows transcending the old and the new. “We’ve created a Victoriana back, to match in with the old buildings behind but designed the front as contemporary. The idea behind that is to break it up from the surrounding buildings and the surrounding environment – and to be different”, explains Clayson. He points to the pairing of traditional timber sliding sash windows at the rear of the lodge house, and against traditional timber stonework with aluplast Ideal 70 in grey against white render. “To use timber sashes on one side with PVC-U casements on the other, is very unusual but it’s going to be absolutely stunning”, says Clayson. “It delivers exactly the difference that we were looking for on this project”. This is a mute-point. Clayson argues that differentials are key in a crowded commercial space. DGlass’ decision to partner with aluplast, driven by a search for a level of differentiation in the new build arena. Ideal 70 is part of a comprehensive offering from the German systems house, which also includes its new Ideal 4000, contemporary SquareLine system and Lift-and-Slide door. These are also available in its aluskin external aluminium fascia system. The Ideal 70 and Ideal 4000 are also supplied in an ecotech format. This uses a pioneering production process to return pre and post extrusion product and post fabrication waste plus known source post installation pelletized, PVC-U into the extrusion process whilst only virgin material is used on the external profile walls.. This uses two compound screw feeds to push recycled and virgin material simultaneously through the profile dye to create the profile, while maintaining a distinct separation between the two. This separates and at the same time isolates recycled material away from areas of the frame visible to the end-user or which perform a structural role, which means that aluplast can guarantee surface and finish quality. Clayson concludes “It [Ideal 70] is an upsell. You can sell it against aluminium. We can deliver great design, the u-values and better value. You need to be brave enough to fight for your product with architects and with clients and say ‘this is what we do’.